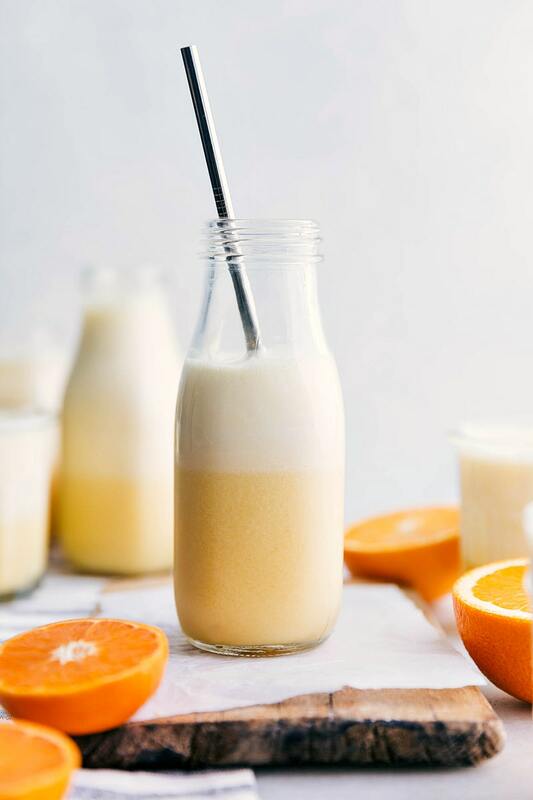 A copycat orange julius made in the blender using orange concentrate, milk, vanilla extract, and a little bit of sugar! We love this orange julius for a fun treat! When in the mood for a healthier smoothie, we whip up an acai bowl, this blueberry smoothie, or this strawberry banana smoothie. I don’t know how exactly it started, but growing up, our Christmas morning tradition always began with homemade cinnamon rolls and an Orange Julius. We never really had Julius’s outside of Christmas (I’m not sure why as it seems more of a summer treat anyways), but it simply wasn’t Christmas morning without it! While stores charge a good amount of money for an orange julius, they couldn’t be easier to make in the comfort of your own home. Plus a lot more economical! 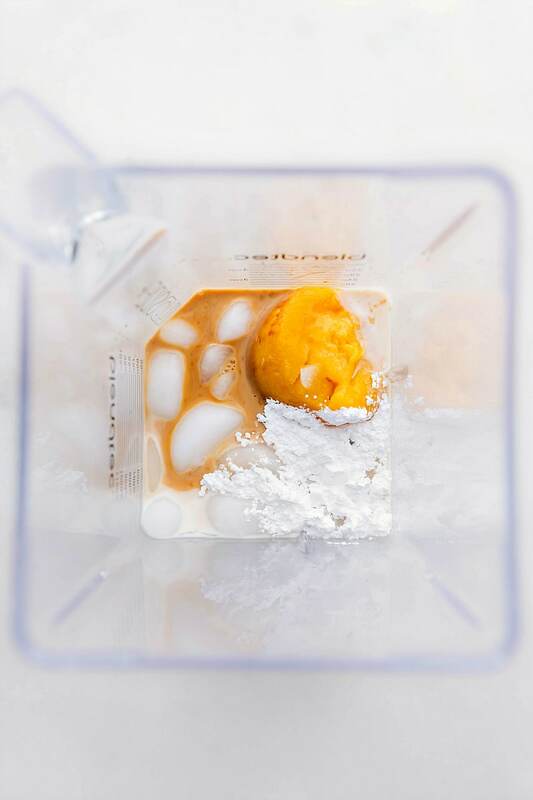 Combine ingredients: add your orange juice concentrate, whole milk, water, powdered sugar, vanilla extract, and ice cubes. Blend: to get the perfect consistency you want to blend your Julius until the ice is all combined and there is a frothy consistency. Chunks of ice make this smoothie much less enjoyable! If you haven’t ever had this famous treat from a Dairy Queen, you might be wondering it actually tastes like! What does an Orange Julius taste like? 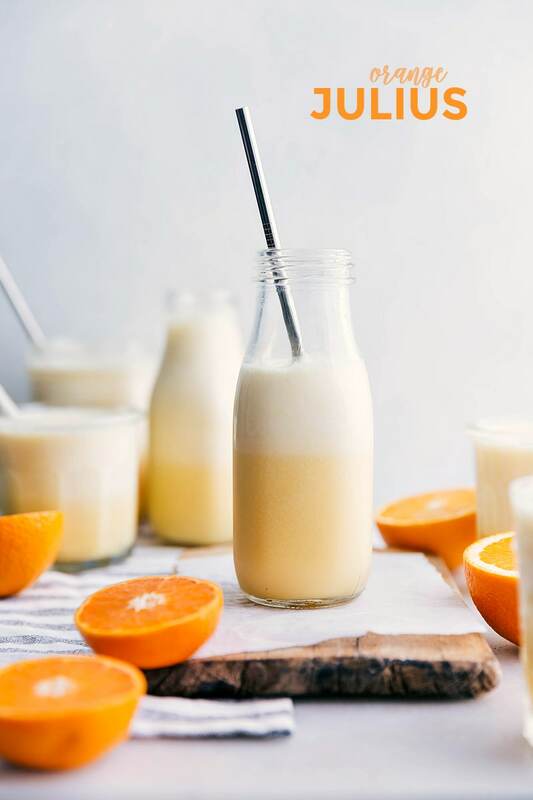 An Orange Julius is a dessert-like smoothie. It’s not as thick or milky as a milkshake. 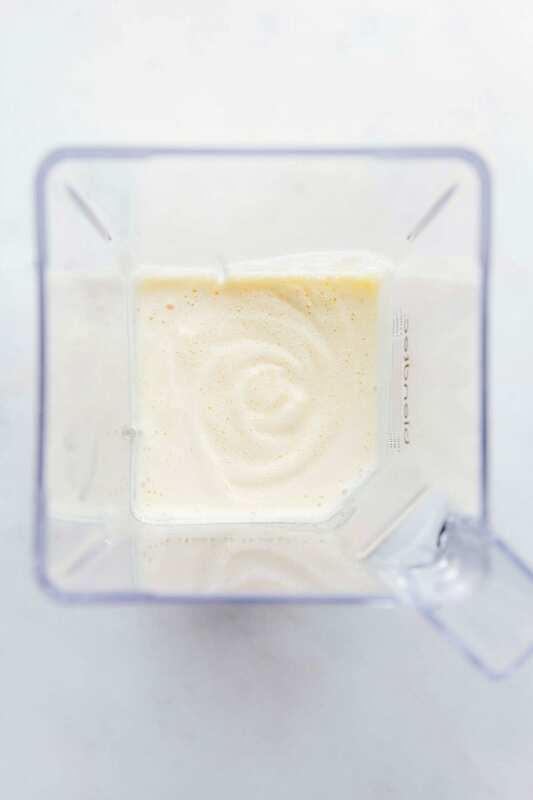 This smoothie is a blend of orange juice concentrate, vanilla, milk, ice, and sugar. They’re sweet, slightly tangy, and tastes similar to a creamsicle. Orange julius’s also tend to be quite frothy towards the top. A Julius drink has a thin, more icy, and frothy consistency than a smoothie. A smoothie is typically thicker and has an array of fruits and/or veggies in it. You’ll find smoothie recipes are generally quite a bit healthier than this recipe. Is an Orange Julius healthy? I would definitely categorize an Orange Julius as a treat. 🙂 While I wouldn’t consider them healthy, I think they’re a great dessert to have in moderation! Author: Chelsea, my mom's recipe! Combine everything in a blender and blend until completely smooth and no ice chunks remain. Looks so refreshing! Love the flavors! What a perfect smoothie for the summer, Chelsea! Especially with the yoplait added in…love your secret ingredient! Pinned! This smoothie looks so creamy and refreshing! I love that it is light too – such a perfect way to indulge without over-indulging! I LOVEEE skinny smoothies! I’ve lost a few pounds this month by drinking smoothies. This smoothie looks super creamy and delicious! What a groovy smoothie, Chelsea! 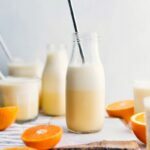 I know I did a creamsicle-esque smoothie in the winter when I needed a high dose of vitamin c (colds, man, they are the worst) but I love how you “skinny-ified yours and how creamy it looks! 😀 YUM! how cool that you used the creamsicle yogurt in this! SUCH a genius recipe-yum! My husband is a big fan of orange creamsicle! I’ll have to make this for him soon! Yes! Thanks for the clarification – I just updated the recipe! Hi! I’m not, nor ever have been a fan of creamy orange, but it does sound good. What I really wanted to say, and you don’t have to post this, is I love the napkin, towel or whatever the blue & green fabric is! It would make a beautiful scarf! So what is it and were did you find it?! 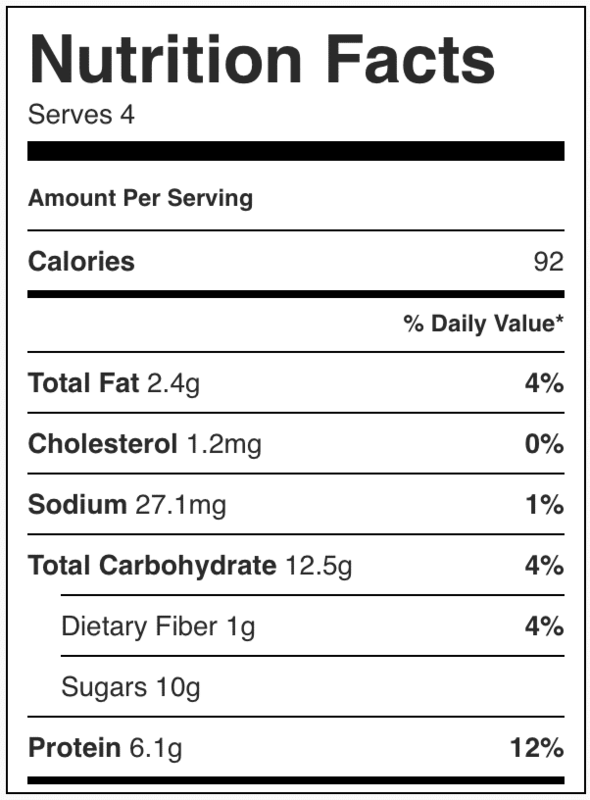 Hi, do you happen to know the nutritional information on this, like Carbs, Proteins, Calories? Thanks in advance.